My biggest worries re. leg lengthening: the cost, downtime, and pain. I can vouch for that. During the first two weeks after the tibias surgery, I've had several episodes of pain of such intensity that I cried and shivered, and no prescription or alternative meds would help. The only way around the pain was through it - letting it pass, sometimes for half an hour of level 9 pain. I'm now in the hospital, recovering from the femurs surgery. I have access to, in theory, the latest in pain management from the leading American clinic specialized in orthopedic surgery. Yet, I've had two episodes of atrocious pain while in the hospital, one after lengthening the tibias, and another a couple hours ago, when my right leg started to hurt in places that were not operated on - right under the toes and up to the top of the foot. Nerve pain of such intensity that, with tears in my eyes, I asked the nurse if I could hold her hand while the toradol IV made its way into my system. The nurse was out of ideas. There was nothing more they could do. During the first episode, I ended up taking morphine. If you asked me at that point, "Is this the best you could do for your life with $175k and 6 months of time off? ", the answer would be "Absolutely NOT!". But the human brain (or at least mine) has this (in)ability to remember extreme pain as a so-called "declarative memory", e.g. "I broke my leg when I was 10, and the pain was very intense". But we can't really experience and truly feel that pain again on demand. 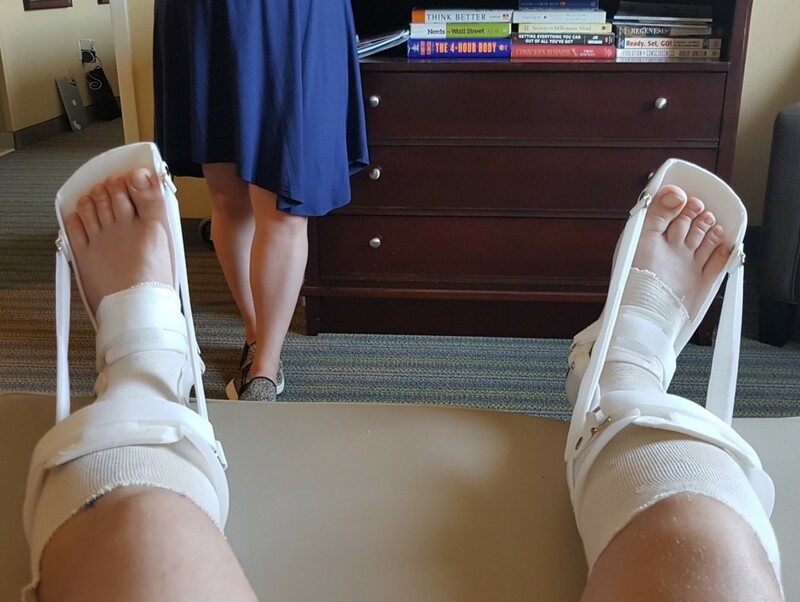 So if you ask me now, as I'm writing this a couple hours after that excruciating pain episode, "Knowing what you know now, would you still choose to do leg lengthening? ", my answer would be more moderate: "Maybe not, now that I know how bad pain can get, and that I have to spend 4 months with pain episodes like that, and sleep horribly every night". And if you asked me if I'd do it in 3 months from now, when the distraction phase ended and the pain went away (save for PT), I might even say "Yes, I'd do it". Funny how the mind works. While deciding to undergo CLL, wait for a moment when you're in really bad pain, and ask yourself if you want to do it and suffer that kind of pain continuously for several days, then intermittently for 10+ weeks. Write the answer down. If you decide to undergo CLL, remember than pain does pass, and it becomes a theoretical memory of the past. So far in my quadrilateral leg lengthening journey, I've encountered a few different types of pain. These come from your bones being fractured, and from the soft tissue recovering and lengthening. They're relieved pretty well by opioids (narcotic) analgesics like Oxycodone, Dilaudid, or combinations of opioids and non-opioids (acetaminophen) like Norco or Percocet. "The clinical studies referred to above indicate that opiate addicts and pain patients are largely separate populations and that opiate addiction due to appropriate medical management of pain is rare." Unfortunately, this risk has been blown out of proportion and misinterpreted, such that the Paley Institute is reluctant to prescribe too many opioids, and plain refused to prescribe me extended-release oxycodone (aka Oxycontin - which is what helped LLF member DIFM get decent sleep at night when he did LL in 2015). Another problem with these opioids is that they take at least 30 minutes to kick in (and up to one hour), and only last for 3-5 hours. In the hospital, I was able to request a 4-hour schedule for Dilaudid, but beware that if you report a low pain level (e.g. 2) when the nurse comes to offer the pain killer 4 hours after the previous administration, they're obligated to delay it until your pain level increases. Thus it makes sense to pay close attention to your pain level, and call the nurse as soon as it starts going up. Remember, it takes at least 30 minutes for the medication to start working, and you don't want to spend those 30 minutes in pain level 6-7. Painkillers ruin appetite, which will slow your recovery due to reduced caloric intake. See the Diet page. Opioids don't work on nerve pain. Try to get off opioids as soon as possible, but not before two weeks post-surgery. Different people respond differently to various opioids. Dilaudid seems to work better for me than oxycodone. Ask your care team to try different formulations and see which one cuts most pain for you. It might be interesting to also alternate them, so as to not build tolerance to a particular pill. This is TBD but is similar to the recommendation to alternate kratom strains. Ibuprofen has been found to interfere with bone formation. Use Tylenol instead. It won't do much (it only alleviates mild pain), but it won't mess with your bones. This pain is caused by nerves being stimulated in unfamiliar ways (e.g. after the peroneal nerve decompression that Paley performs preventively) and of course by lengthening. It feels like a burning sensation, and often in places that were not touched by the surgery. IAmReady described it as an electric burn in his tibias journal, and it felt somewhat similar to me, albeit fortunately less intense on an ongoing basis, probably thanks to a new medication that the Paley team put me on: Neurontin. I've been taking 600mg every 8 hours and still had several excruciating episodes of nerve pain, but who knows how much worse I would've been without it. Do ask your doctor about it. The Paley team typically prescribes it to only 10% of CLL patients, but I made sure to emphasize that I had a pretty low pain tolerance. After two weeks, my evening dose was upped to 900mg after I complained of burning pain in one shin. I can't yet tell if this has improved things. Wearing long, semi-loose socks (compression socks were too difficult to get onto swollen shins) that formed a "second skin"
Cool smooth bed sheets. Satin would've been great probably, but the hotel just had regular cotton sheets. Another LLer called these "torture devices". I'm not sure how anyone can honestly score 22 hours per day wearing them. I've ended up just giving up on wearing the boots all the time. I wear them until the ankle straps drive me nuts, then I take them off and put them on again when I go to PT in the morning. As of 6 weeks after the tibias surgery, my ankle flexibility is way down, and while using the walker, I can see the "ballerina foot" starting to manifest itself. My range of motion in the ankle has gone down from 15 degrees to 12 (left) and 10 (right). Solution: ask for an Astym massage. It's EXTREMELY painful, but only lasts for half an hour, and it really works. 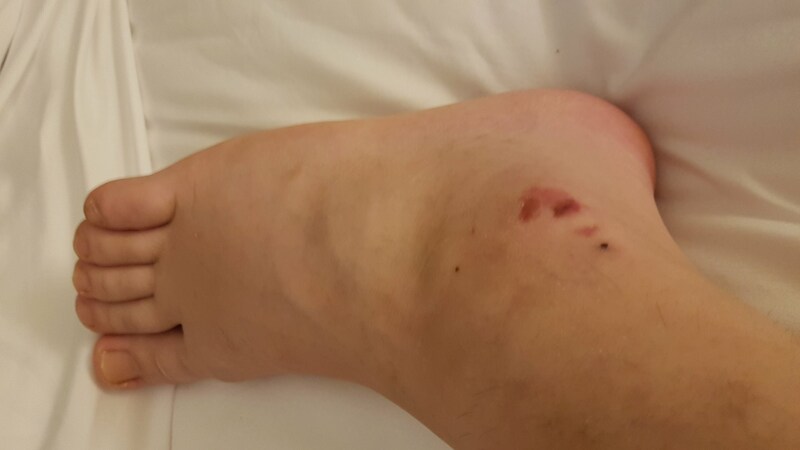 I had it done during PT on April 26 (6 weeks after tibias) and it restored my ankle flexibility from 12 to 15 degrees. I'd much rather take that pain, than wear those boots 22 hours a day. If you're used to waxing your hair off, you can skip this section. But if you're not keen on the idea of ripping your hair off, read on. For reasons I can't fathom, men aren't advised in the pre-surgery instructions to simply shave their hair where IV lines might come in. This means the back of the hands, and perhaps some forearm areas if you want an IV there. Note: don't ask for an IV to be placed in the antecubital fossa (inside of the elbow, where they typically draw blood from; inexperienced nurses might do that, but it's a bad idea). 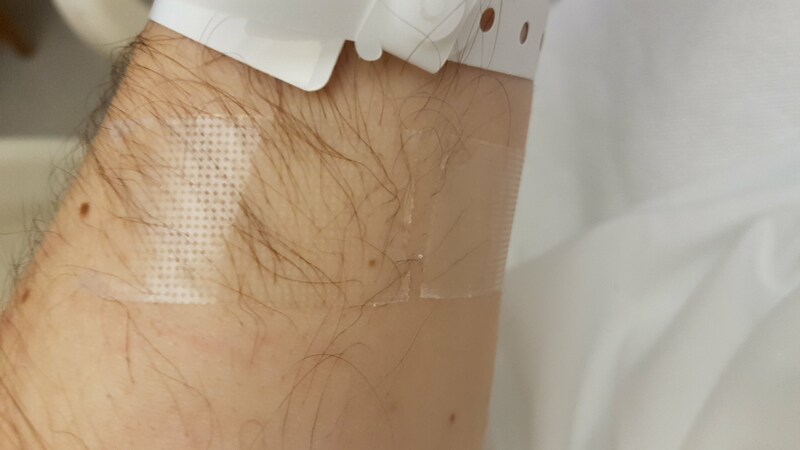 Anyway, the problem with IVs is that they need to be stabilized against the hand/arm, and some nurses use excessive amounts of tape that sticks to your hair (maybe female nurses don't really relate to men having hair on their paws?) and it hurts like hell to have removed. Detachol - a medical grade product for removing medical tape. Unfortunately I didn't have time to order it, and St. Mary's hospital hadn't heard of it. Baby oil - people swear by it. Again, not available at St. Mary's. Coconut oil - this worked. Minimal pain while removing two IVs, though it took about 10 minutes of gently rubbing the oil at the base of the tape while peeling it off. Related to pain is the problem of "hellish nights of poor sleep", as one LLF member put it. Lack of sleep screws you up in all sorts of ways, including with decreased pain tolerance and increased irritability. Since painkillers only last for a few hours, you're unlikely to get decent sleep. LLF members and fellow patients I've met report very poor sleep throughout the distraction period. The opioids prescribed to patients have their own impact on sleep, but more importantly, they allegedly cause addiction, so doctors prescribe less and less as time goes on - which means you'll be in pain more often. I didn't get any refill on oxycodone/norco. So far (5 weeks post tibias and a couple weeks after the femurs surgery), I've been lucky to get 4 hours of sleep out of spending 12 hours in bed. I've read that patients who only did femurs still had terrible sleep. Kratom seemed to help, by putting me to sleep, but the effect only lasted for two hours or so, until shin skin hypersensitivity would wake me up. What DOUBLED the amount of sleep I got was a latex foam mattress topper. My guess is that its bounciness cradles the body and decreases the natural reflex to switch positions during the night in order to avoid pressure sores. Unless you want to risk jail and obtain your own opioids (and increase the risk of addiction), it's worth looking into alternatives. Several promising ones came to light during my research. Marijuana has been caught up in the silly (and ineffective) "War on drugs" in the US, and as such, research into its medicinal benefits has been limited. However, its two main components, THC (psychoactive) and CBD (non-psychoactive), do have medical benefits. There is high-quality international research (such as this study showing that CBD markedly enhances callus formation), and there's also a very large amount of anecdotal evidence for the anti-inflammatory and analgesic effects of cannabis - including my own experience. CBD didn't really seem to help me with nerve pain either, but due to the individual differences mentioned above, I'm suggesting you try it anyway, given it's non-psychoactive. 5mg of THC in a CBD:THC 1:1 oil had the most remarkable pain relief effect, dropping pain from 7 to 4 while stretching my calves and ankles in the walker. The problem is that 5mg of THC can get you high, which can result in accidents. Best taken if you have a caretaker to spot you. Note that a 2008 study showed that "Cannabis sativa smoke inhalation decreases bone filling around titanium implants". The full study is paywalled ($49), but I found a book chapter talking about it, which revealed they fed the rats so much THC smoke that 7 of the 30 died "because of respiratory failure". Also, the negative effect they found was only in "cancellous bone for bone-to-implant contact", which we aren't really concerned with in CLL. We care about callus formation. Another study showed that THC reduced the stiffness compared to CBD, but the dose they used on rats was 5mg/kg/day, which for an average-sized human translates to 300mg/day, which would keep you stoned out of your mind. So I wouldn't worry. STAY TUNED: I might drop more research in this section. Kratom is a tree that grows in South-East Asia. Certain strains appear to have pain killing effects. It's mostly legal in the US. I've purchased a bunch of varieties but the pain relief effects were hard to tease out. Kratom might also help you fall asleep, but given the sleep deprived state I've been in during the entire recovery, that's also hard to say for sure. Today, May 28 2018, (2.5 months since the first surgery, and two weeks after I stopped lengthening the tibias) I slept for about 5 hours during the night, and I still passed out for a nap from ~2pm to ~5pm even without an eye mask to shut out the daylight, let alone any supplements. Hard to distinguish a particular intervention from sheer sleep deprivation. Among the Paley team, another PA who is well-versed in nutraceuticals, suggested kratom was OK to take, but it has a short half-life, so it won't help for more than a couple hours, and might reduce the effect of opioids. She advised I not take it 24 hours before my second surgery. Agmatine is one fascinating substance, widely used in bodybuilding, with nootropic properties, and which was also found to potentiate the effect of many other drugs, including opioids. This means you need less oxycodone and oxycontin to keep pain away. It's also fully legal. It also was found to decrease tolerance to opioids. It does sound too good to be true, and to date, nobody on either forum appears to have used it (!). I tried 1g a couple times with oxycodone, and it was unclear if it enhanced its effect. However, collagen didn't seem to help with flexibility. I had to stop lenghtening my tibias due to tightness at only 3.5cm. On the other hand, I could've done a lot more PT at home. In any case, collagen wasn't a magic pill. Before the femurs surgery, my Range of Motion was evaluated as "excellent" - 14 (104) degrees for the ankle dorsiflexion, and 140 degrees for knee bends. I stopped lenghtening the tibias when my dorsiflexion dropped to 8 degrees. Two weeks of PT later, the dorsiflexion returned to 10 degrees.